We got to spend some time with Libratone's TRACK+ earlier this year at CES and they finally launched here in the US last week. After spending some quality time listening to tens of hours of music, we've developed quite the fondness for Libratone's latest headphone. Libratone, the Danish company also responsible for the AirPlay-equipped Zipp speaker we recently reviewed, created the TRACK+ as a wireless version of their Q-Adapt headphones, though much more than the design was improved on. Right out of the box TRACK+ makes an impact. It has impeccable design that looks sleek and modern. There is also a feeling of quality that comes when you gets your hands on them. They have a bit of weight, but still feel extremely light. Aluminum is used for the back of the earpieces as well as the inline controls. They don't feel plasticky at all like we've seen with so many other headphones. Connecting the earpieces is a velvety smooth piece of (assumedly) silicone. Whichever material is used to cover the wire of headphones is important -- that material will be on the back of your neck, as well as occasionally making contact with your collar. This is especially apparent while running. Most headphones use a cheaper, stiffer material. This will cause a rustling sound being funneled into your ears. Using this super soft silicone is not only extremely flexible but will almost entirely reduce that noise of rustling hitting the headphone's wire. It is a subtle, but important design decision. When worn, inline controls sit on either side of your neck. To the left is a function button used for power, as well as changing the levels of noise cancellation. To the right are your usual array of media controls including play/pause, volume up, volume down. It is easy enough to control your audio through those controls, but honestly, it is still more convenient to use Apple Watch. I'd much prefer to use the ever-present wrist controls than reaching up to my headphones. TRACK+ also has two microphones built in for making calls and noise cancellation. For workouts, TRACK+ has IPX4 water resistance to protect it from sweat or splashes. I have a tendency to resent in-ear headphones. They never reliably stay put, especially when I am running. TRACK+ bucked that trend with their unique fit. Not only does the tip recess into your ear, the body rests slightly on the outer section of the ear. Additionally, there are optional "wings" included that fit slightly up your ear for a much more stable fit. When testing, day to day use I didn't need the extra wings, but I went running, I found them to be useful. I also sat and wore the headphones for nearly eight hours while working and had little to no fatigue or soreness. There is no shortage of noise-canceling headphones on the market. A quick Amazon search yields more than 10,000 results alone, with very little to differentiate them. Libratone's trick to separating themselves from the pack is their proprietary CITYMIX SMART adaptive noise cancellation. There are four levels of noise-canceling; pass-through, passive, 50 percent, and 100 percent. Level one lets outside audio pass through, only blocking 20 percent of outside sound. Making it possible to hear what is going on and carry on a conversation without removing the headphones. Level two has a small amount of active noise cancelation great for wind noise and letting the music come through while also being aware of the surroundings. It blocks roughly 40 percent of outside noise. Level three blocks 70% of outside noise and good for noisier environments. Level fours maximum noise cancellation blocks over 90 percent of outside noise, immersing the user in their audio. If you really want to hear what is going on, there is ambient monitoring mode. This will pass through all audio, letting your monitor your surroundings. The noice cancellation settings can be controlled manually within the app, or via the function button on the headphones. What's more impressive is instead of relying on manual adjustments there is the "smart" mode. In smart mode, the headphones will automatically adjust the level of noise cancellation level as needed. In our testing, this worked really well. We tried several different environments including downtown in the city, riding in different vehicles (with and without the windows down), running outside on a windy day, and relaxing at home. It was easy to notice the noise cancelation stepping up or down based on the surroundings and did an excellent job. In short, the noise cancellation was as good as almost any other that we've tested. We did notice the slightest hint of a background hiss when we had the TRACK+ set to level one with passthrough audio with no music playing. Once music was playing, however, that noise wasn't present. Any headphone or speaker can have a solid build and fancy ANC, yet still be garbage if the audio quality isn't up to snuff. Libratone really did a great job here with the TRACK+. I honestly loved the sound that came through these headphones. My usual testing regime is a mix of several music genres including rap, pop, classic rock, jazz, instrumental, and spoken word. While I don't personally listen to all of those categories regularly, I think it is only appropriate to give all of them a try on any pair of speakers or headphones we test. With my tastes taken into consideration, a considerable amount of time was spent listening to classic rock over the rest. While listening, the music always came through exceptionally clear, with sufficient bass. The TRACK+ isn't as bass heavy as the Beats lineup, but it was plenty enough for me. All the music I tested sounded good, but listening to the intricate guitar riffs of Joe Walsh really brought a smile to my face. There was excellent separation in each note and vocals felt right in the middle of the mix, where they should be. Audio sounded very smoothed out, a bit more level than we'd heard from other pairs of their headphones. The upper midrange still shine and feel quite snappy, though overall has a warm feeling to it. But, sheer volume we found a tad underwhelming, compared even to the wired Q-Adapt headphones from Libratone. Libratone says the TRACK+ will last up to 8 hours on a single charge, though we noticed this dropped down to just over 5 when noise cancellation is on max. 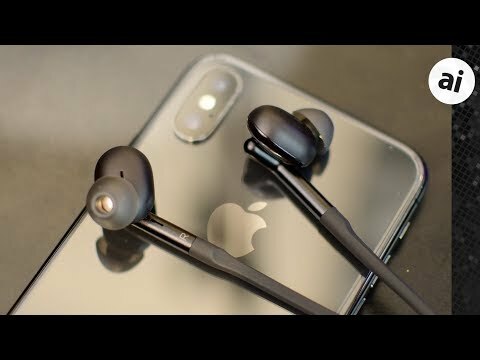 This underperforms several other wireless headphones, so if pure battery longevity is the most important factor, shoppers should look elsewhere. They also don't have the convenience of relying on a portable case for additional battery power like we see with AirPods and other wireless earbuds. Powering them up still relies on micro USB, which is one our biggest frustrations. It seems ill-advised for a new product to launch in 2018 continuing to rely on micro USB rather than USB-C. Both Apple and other manufacturers have started to shift to USB-C. When a product will be around for a couple years, it is going to be even more dated at that point. Apple users are stuck carrying around one more cable on the go. Lighting for iPad and iPhone, magnetic puck for Apple Watch, USB-C for the Macs, and micro USB for the TRACK+. I'd be much happier if I could just use the USB-C cable(s) I carry instead of needing a micro USB for this one device. One nice touch that helps prolong battery life is motion detection. TRACK+ will automatically turn off after 30 minutes when no movement is detected, then will wake up as soon as you put them back on. Apple's BeatsX is an appropriate comparison to the Track+. They both have similar styles and features that make it somewhat difficult to choose between. BeatsX wins in two primary categories. Wireless connectivity and bass/volume. Inside the BeatsX is Apple's W1 wireless chip. It is really hard for anyone to compete with Apple in this regard. W1 affords the BeatsX exceptional 100ft range that is so convenient when moving about in your home or gym. Standard Bluetooth, like included on the TRACK+ is limited to maybe 30 feet. Bass is also a signature of the Beats line. There is much more than seen on the TRACK+, and even added volume as a whole. When we flip things around, the TRACK+ wins in many other areas. Looks and build quality are solidly won out by Libratone. The choice of materials simply feel more premium. We also prefer the svelte design over that of the BeatsX. TRACK+ also has a smoother, more balanced sound that will appeal to many listeners. Neither AirPods or BeatsX have built-in noise canceling, let alone adaptive noise canceling, so TRACK+ is unopposed in this regard. AirPods have a convenience factor that is hard to match with a semi-wired design, but they still only have three hours of use time before they need to be recharged in their case. We've also had issues with the AirPods staying in during running or other exercises. Looking at all three, AirPods win for convenience and portability, but the TRACK+ are the go-to for all other situations, especially where any degree of noise canceling is needed. In the end, we give the TRACK+ a very favorable rating of 4.5 out of 5 stars. Only the underwhelming volume contributes to the lacking 1/2 a star. Quality audio, solid design, and impressive adaptive noise cancellation all contribute to a solid product for anyone looking for great wireless headphones. The Libratone TRACK+ wireless headphones are available for $199 in either stormy black or cloudy white. Which side is the receiver on? AirPods are great for me because the left side always has a great signal from my watch, on my left wrist. I have phenomenally good sounding headphones that I stopped using once I started running with an Apple Watch because of drop-outs on arm swings. Also, the Beats comparison probably deserves a note about the terrible reviews for Beats headphones on Apple’s own site. It reads like people are getting repeated replacements under warranty repeatedly (2 stars). Is this a paid/free sample review? it is good to stated in the article. This page intentionally left [nearly] blank. I think the article meant, nearly wireless. Air pods are the new definition of wireless. It may be a free sample review since AI get a lot of stuff sent to them for review. Having said that, I don't think they do paid reviews and if it's an ad, they'll probably be up front about it. So no, I don't think they were paid to write a positive review. As people like me get older, 77, more information about the treble boost would be useful. Does treble boost function on pass through mode? Does their control app app work on 1st generation  Watch? And show  Watch in video. BeatsX launched at $149, only $50 less than the TRACK+. I don't think is a huge amount of difference for a substantial improvement in the product. Better quality, better sound, more controls, fit better, noise canceling, it goes on. We mainly compare it to BeatsX because it is one of Apple's headphones, and the one most similar, not because of price. These looked potentially interesting, right up until I got to the modest 5 hours battery life with full noise canceling enabled. Like quite a few travelers I use my (Bose) noise canceling headphones to reduce ambient aircraft noise, a task for which they're very effective. While a lightweight, wireless alternative would be very nice, that kind of minimal battery life just doesn't do it. I've just completed a transatlantic round trip with the Bose headphones without needing to recharge them at all. This Libratone wouldn't even make it one way. There are more less two passthrough modes. First is level one of the noise canceling. In this situation, yes they work because your audio is playing. It does not work in Ambient Monitoring mode because that will mute the headphones audio and purely passthrough the audio that surrounds you. There is no Apple Watch app, when I refer to the Apple Watch's ability to control your media, that is done in watchOS itself. Whenever content is playing on your iPhone, the Apple Watch will show media controls include play/pause, forward/back, AirPlay/Bluetooth sources, and volume. Correct, a paid review would be considered sponsored content. A publication is required by law to disclose sponsored content. Andrew_OSU said: BeatsX launched at $149, only $50 less than the TRACK+. I don't think is a huge amount of difference for a substantial improvement in the product. Better quality, better sound, more controls, fit better, noise canceling, it goes on. We mainly compare it to BeatsX because it is one of Apple's headphones, and the one most similar, not because of price. The only substantial difference between the products is the Libratone providing noise cancelling and the Beats X having the W1 chip and better battery life. Everything else sounds largely subjective...sound quality, minor finish differences, fit for your individual ear shape etc. Fun fact? Nearly everything we get to review is a loan, and has to go back to the vendor. For sure these can be subjective. When it comes to those things, all we can do is give our personal experience with both products and advise on which we prefer. In my case, TRACK+ fit better, sound better, look better, and I find noise canceling more important than the W1 for most use cases. At least these are doing their own thing. Anybody see these shameless chinese knockoffs? ...at first glance I couldn’t tell them apart. I doubt my mom would be able to at all, the design language is so intentionally easy to confuse with Apple’s. If ever there was any doubt this brand is a blatant ripoff artist, aping whatever Apple does, this eliminates it.